Someone once told me that food should make me happy. As the days go by, I am pleased to report that I am happy and my meals are to blame! The food I am eating, tastes great and is made with a sincere effort for a fantastic meal. Last night, I cooked up a very simple meal for myself. 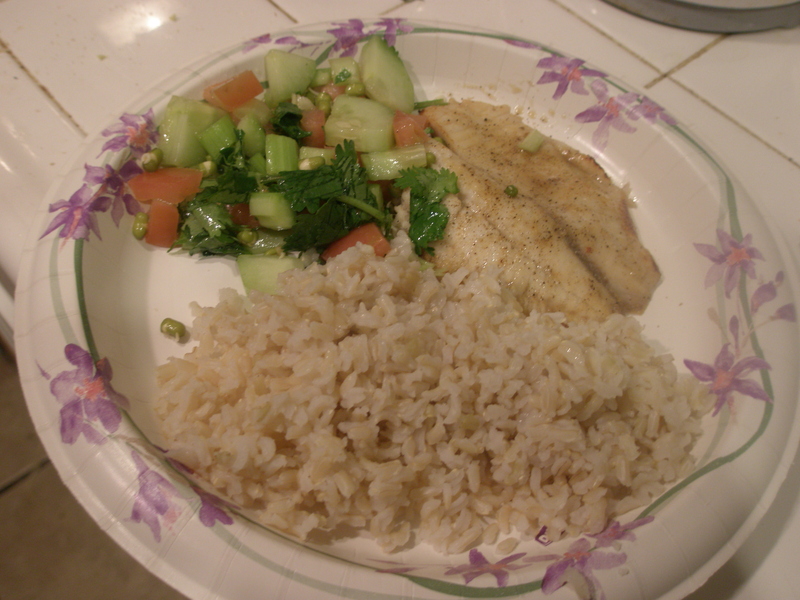 Baked Tilapia (seasoned only with Montreal Seasoning and a dash of Lea & Perrins), a side salad (chopped cucumber, celery, mung beans, olive oil, vinegar and topped with cilantro), and a healthy serving of brown rice. This meal took all of ten minutes to make, and required no recipe. Just dashes and dabs of whatever I found in my kitchen. A great meal after a hard workout at the gym!